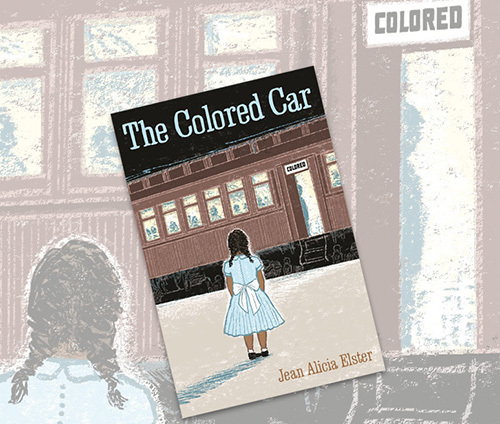 In The Colored Car, Jean Alicia Elster, author of the award-winning Who’s Jim Hines?, follows another member of the Ford family coming of age in Depression-era Detroit. In the hot summer of 1937, twelve-year-old Patsy takes care of her three younger sisters and helps her mother put up fresh fruits and vegetables in the family’s summer kitchen, adjacent to the wood yard that her father, Douglas Ford, owns. Times are tough, and Patsy’s mother, May Ford, helps neighborhood families by sharing the food that she preserves. But May’s decision to take a break from canning to take her daughters for a visit to their grandmother’s home in Clarksville, Tennessee, sets in motion a series of events that prove to be life-changing for Patsy. After boarding the first-class train car at Michigan Central Station in Detroit and riding comfortably to Cincinnati, Patsy is shocked when her family is led from their seats to change cars. In the dirty, cramped “colored car,” Patsy finds that the life she has known in Detroit is very different from life down south, and she can hardly get the experience out of her mind when she returns home—like the soot stain on her finely made dress or the smear on the quilt squares her grandmother taught her to sew. As summer wears on, Patsy must find a way to understand her experience in the colored car and also deal with the more subtle injustices that her family faces in Detroit. By the end of the story, Patsy will never see things the same way that she did before.